Welcome to the Island of Koh Rong Samloem! We may post a lot of amazing beach pics, but there is one beach on Koh Rong Samloem that now holds our favorite beach rating. We had originally planned on being on the Island for 2 days visiting a friend, but ended up staying a couple weeks. This piece of paradise is one that you need to visit asap as you can it starting to develop. There are no roads and sand fills all areas. Lucky for you we bring our drone along with us for the fun. 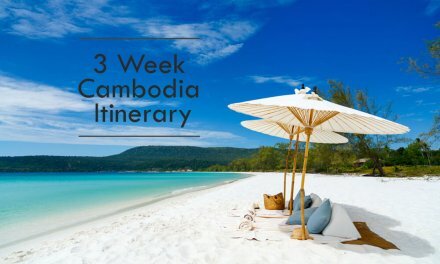 This might be surprising to you, it was surprising to us as well that we found one of our favorite beaches in Cambodia. Cambodia is definitely not well known for it’s beaches. Cambodia features a small geographic portion of the country that shares the Gulf of Thailand. Here you will find 4 coastal provinces of Sihanoukville, Koh Kong, Kampot and Kep. One of the most popular islands on the coast is Koh Rong and it’s sister Island Koh Rong Samloem. Koh Rong and sister Island, Koh Rong Samloem, are both gorgeous and just a short ferry between each other. Even though they are located close, each Island features a very different vibe. Koh Rong is much more of a party island that is a lot louder and is much more developed. The guest houses (pretty much pubs) almost compete with each other playing loud music that goes very late. Koh Rong Samloem on the other hand, is a very chill island. There are 2 different vibes on Koh Rong, a very “hippie crowd” or “resort go-ers”. People do not start or or stay up late, it is a very sleepy Island. You are more likely to find yourself on a deserted beach here on this Island. They do however host a Saturday night jungle party just before the Full Moon Party on Koh Rong. This Island just in 2017 started to get WIFI in selected places. We recommend going to both, but personally spent our entire time over at Koh Rong Samloem after we fell in love with this Island. 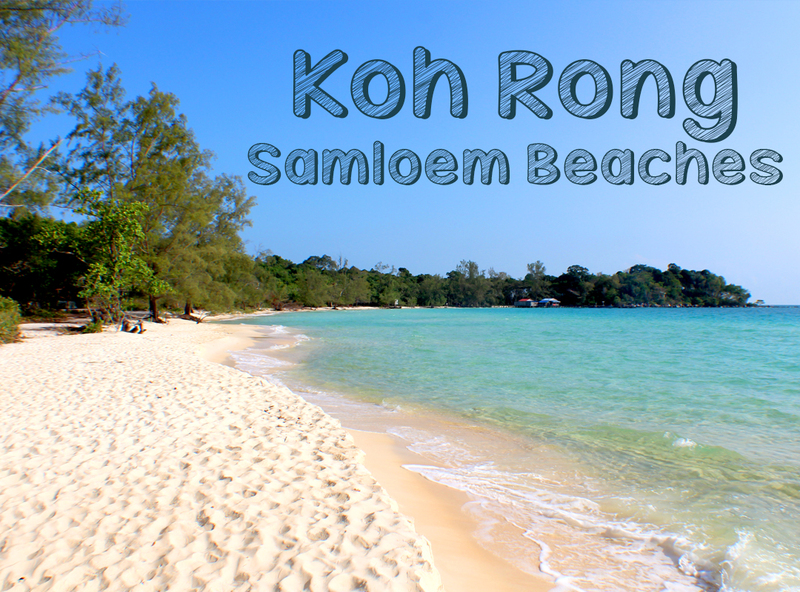 So we have put together a guide for your stay on Koh Rong Samloem. Important. Before you set sail, we recommend you visit an ATM to have cash with you as there are no ATM’s on Koh Rong Samloem and only 1 on Koh Rong. Don’t bring only $100’s with you as it’s nearly impossible to get change. If cell phone service is important, Smart is the only provider that offers service, and fair warning, this still can be iffy. You might want to consider a backpack vs luggage for you stay since each Koh Rong Samloem does not have roads. When you want to leave, you must book your ticket 24 hours in advance with the ferry company. Check out our video, Top 3 favorite beaches of Koh Rong Samloem, or keep reading below. Our last stop on Koh Rong Samloem was at Saracen Beach. As amazing as these pictures are, it still does not do it full justice. Saracen is a beautiful beach that stretches 3 km long, lined with beach resorts of all kinds. Here you will find high end beautiful moonlight clay bungalows, hut bungalows and even double bed hostels. 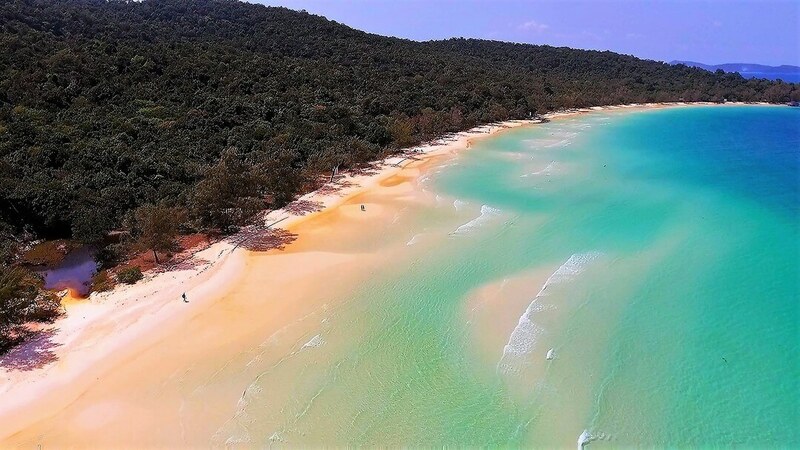 This is the most well known and visited beach on Koh Rong Samloem. What’s unique about this beach, is the beach is the “road”, there is no village or shops except the restaurants, bars, hotels, and shops located on the beach. So walking the stretch of the beach you will find many options. Logistics of your stay here. It’s also not rare to see a poor traveller dragging his suitcase through the sand from the ferry terminal to the middle of the beach, which can easily take up to 15 minutes to walk. A backpack would be suggesterd. This beach is the first place on the Island that had wifi. So it was important for these Digital Nomad’s to get some work done while enjoying this amazing scenery. Saracen is the most expensive place we stayed at in Cambodia, so you will want to budget more for your stay here. We stayed at a little bungalow at the Beach Island Resort on the beach for $23 / night under bug nets while listening to the waves crash. Or you could sleep in a double bed dorm with Ocean View at the Beach Island Resort. A Bungalow starts at around $40. It is not suggested to arrive at this beach and find a hotel, it is very popular and often does not have vacancies. During our stay, people were walking the beach and unable to find hotels with availability. Saracen is literally double the price of everything on M’pai. For restaurant pricing on this popular beach, you will find it to pretty expensive. We were shocked to find that a simple fried rice and vegetable was $5+. Most meals are approximately $8-12, at an average restaurant, not a high end restaurant. Lastly, for approximately half of our stay here we both experienced upset stomach’s, which apparently is pretty common at this beach and on Koh Rong. For the last 2 days of our stay we ate at Lime Life and had no problems. There is not a ton of coral here however there are some really unique white fish to be seen. Otherwise hop on one of the popular snorkeling half day trip tours to see the Island’s best snorkeling. They cost approx $20 to $25 here. If you are planning on visiting M’pay Bay, wait for snorkeling tours till here where the price is half at $5 or $10 dollars. There are a couple Scuba Diving companies on the beach to take you to one of the 9 popular dive sites on Koh Rong Samloem. Go for an afternoon fishing tour and enjoy the sunset at the opposite side of the Island at the same time. 4. Walk to Lazy Beach. Enjoy a quiet chill beach for the day or walk here to enjoy Sunset. Find more info below on Lazy beach, the walk to get here takes approx 25 minutes and quite a nice walk as most of the way is sandy. Bring a flashlight for your way back after sunset, it is treed and will get dark. Flip flops are ok.
5. Walk to Sunset Beach. As the name says, this beach is rated the best spot to enjoy a spectacular Cambodian sunset. The walk here will take approx 45 minutes each way and is a little bit more strenuous and flip flops are not recommended. 6. Walk to the Lighthouse. A nice trek to the Lighthouse on the Southwest part of the Island is a great activity if you like hiking in the Jungle. We took this trail, which took us approximately 3 hours. Being honest, it’s not a very interesting hike and the “lighthouse” gave us a bit of a laugh at the end. You can climb the lighthouse for $1 a person and the view is really neat, not to mention that this is the first time I’ve ever climbed a lighthouse before. There is no shops or anything on the way, so make sure to bring lots of water and a snack. If you don’t want to go it alone on a trek to the Lighthouse, then join up with a guided Jungle Trek. 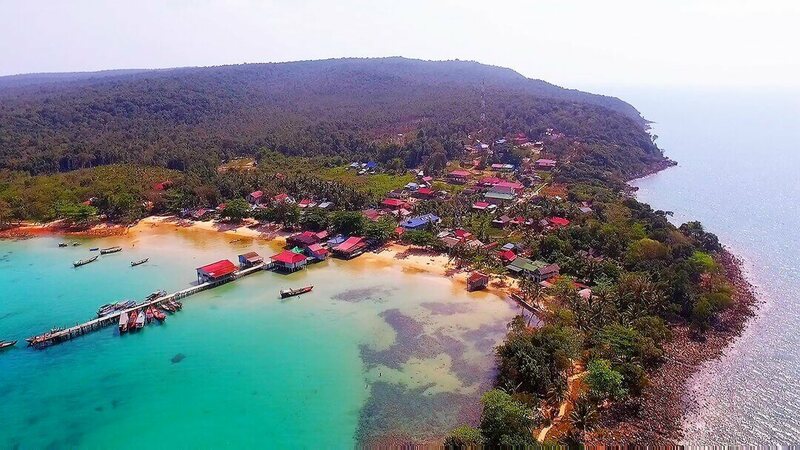 Koh Rong Samloem is 90% non-developed so there are lots of places for trekking. Every Saturday night join the fun party at the Jungle Party. You get there by the same trail to Lazy beach but make a turn to the right, it’s unmissable. 9. Swim with the Bio Luminescent Plankton. This is a magical experience, so after dark go for a swim that you will never forget. Stop looking for something “to-do” and just simply enjoy this spectacular sliver of paradise! The little village beach town that could! 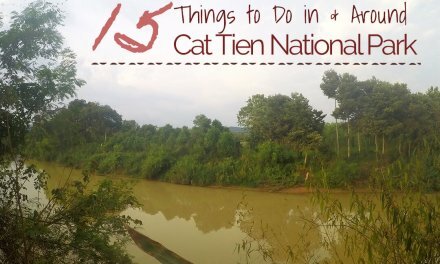 We loved this place and will also be a special memory for us and one of our highlights of Cambodia. No matter when you visit, I’m sure it will be changed from the time we were their as tourism is hitting these Island’s hard. No shoes are required in this small village with sand instead of roads and only stretches less than 1 km long. All the main amenities are on the main road. There are only a handful of guesthouses and bungalow hotels, with around a dozen restaurants and surrounded by a spectacular beach. Here many described M’pay Bei as what Thailand was 20 years ago. This spot is a local village that has a recent introduction to tourism, but still has a lot of village charm. While you are here, we have a couple restaurant recommendations. Reserve your spot for the vegetarian and seafood buffet at The Fishing Hook. This Restaurant has delicious food and a good cause. At the end of the night, any of the buffet that is leftover goes to feed people in the community who are hungry so no food is wasted. Next, make sure to visit the Blue Quay for some delicious Turkish food cooked by wood fire. This was our first time trying a Gozleme, and it was a delicious treat. The portions are quite large so don’t make the mistake we did and order an entree each, you will have so many leftovers! In M’pay Bay there are lots of places to snorkel right off the beach. You can rent a snorkel mask from many small shops on the side of the road for $1.50 and go for a swim. There are 2 popular spots. One is right by the main ferry dock and around the corner by Sunset Bungalows. The other is past the village on the large beach, one of your first mini beaches on the left, you will see all the shallow rocks and coral close to shore. If you are an ambitious swimmer, the Island about 50 meters away is supposed to be great snorkeling. 2. Snorkeling, Fishing & Sunset Tour. A wonderful half day activity, sign up for a tour where you can go to 2 snorkeling spots and then do some fishing while enjoying the sunset. Most tours also offer a BBQ afterwards so you can enjoy your fishing spoils. At Yellow Moon, they offer a $5 snorkeling tour with $2 BBQ and we found this to be great value. There are 2 diving companies in town, Big Moon Diving and Cambodian Diving Group to dive in one of the 9 popular dive spots on the Island. Diving from M’pay Bay is no diving boat required, you simply walk off the beach. 4. Walk to Clear Water Beach. An approximate hour trek through the jungle and along the beach, sometimes through water at high tide. This beach is spectacular and worth the visit! Read more about this beach below. 5. Try a “happy desert”. Hey we told you Koh Rong Samloem was for hippies, here it’s very open that you can get weed infused brownies or desert, often for only $2. 6. Relax at the Beach. Enjoy an afternoon relaxing on the quiet M’pay Beach. Untouched by restaurants, bars or resorts, bring a towel and grab your slice of beach underneath the trees on the shore to enjoy a relaxing day on a spectacular beach. Dragonfly Guesthouse and Sunset Bungalows both offer a wonderful spot to perch and enjoy a breathtaking Cambodian sunset. At Sunset Bungalows find yourself in the round hut or let loose in a hammock nestled in some trees. At Dragonfly Guesthouse you there is a platform overlooking the ocean towards Koh Rong or climb down onto the rocks to be closer to nature. 8. Swim with the Plankton. At night after all the sun sets and the sky is dark and the lights from the local businesses are turned off it’s time to put your bathing suit back on and go for a swim with the bio-luminescent Plankton. At first the waters will look dark and like nothing exciting until you get in there and start moving around, activating the bio-luminescent Plankton, it’s quite a magical experience! There are only a handful of hotels and guesthouses in M’pay Bay. There’s a lot of development happening, so I’m sure there will be more soon. First let’s set some expectations for your stay, this little Island has little water, so don’t expect a normal bathroom with flushing toilet, there is no hot water, there is limited electricity so not a lot of air-conditioning and everything is shipped in so it’s basic accommodations. We chose to stay at a great little place called “Bongs” meaning Brother in Cambodia. The owners were laid back and $20/night for a great little room in a brand new hotel. No wifi and they do not use any booking system, when you walk of the boat you see them. So if you want to plan in advance, we would suggest hotels you can book online including Blue Moon Bungalows and M’Pai Bay Resort. Number 4 listed above in our things to do list in M’pay Bay, in our personal opinion this is the number one thing to do. Clear Water Bay is also referred to as Driftwood Beach and it is not known a popular beach. There is only one ferry that goes to this beach, Speed Ferry Cambodia. When we were here, we made the mistake of not signing up for the ferry 24 hours in advance. We decided it was far more fun to walk to M’pai Bay then catch a taxi for $40. Yes the same price as both of our return tickets to the Island for a long tail boat ride of no more than 20 minutes. We had already done the walk before, an approximate 30 minutes through the Jungle and 30 minutes along the beach. We were surprised by hide tide after we reached the beach the tide was waist deep. If you are coming from M’pay Bay it is the first big set of rocks in the water. Just after this on the land you will see a small sign for the walk to Driftwood. You cannot miss it coming from Driftwood. The day before when we did the walk it was low tide, so we were stuck in high tide waist deep and walked about a kilometer in this. We made a video of it so you can see how amazingly beautiful it is. Just go with it! Welcome to Clear Water Bay on Koh Rong Samloem! This was truly the most spectacular, untouched, and secluded beach we have ever seen in all our travels. This gem of a beach is only accessible by boat or by trekking and only has 1 small very “rustic” hostel we found the true backpackers paradise. We came here to stay with a friend and ended up staying here for 3 nights. It was really special to wake up at 6 am and be the only person on this secluded beach to do some yoga and watch the sunrise. When enjoying your afternoon beach time, you can easily be the only person for meters around making it feel like your own slice of paradise. There is only one accommodation option and 1 ferry that goes here, Speed Ferry Cambodia, read more about the ferry and accommodation options below. Before coming here you need to realize this is a backpackers paradise. The sign said it best when checking in “Rat Eats Through Your Bag Win 5 Shots”. It is very rustic accommodation at Driftwood Hostel, you can choose between a hostel dorm $5 or tent $5. 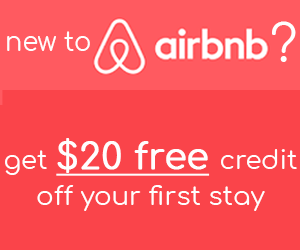 Bonus if you have your own tent or hammock and sleep on the beach for just $2. This spot is run pretty much by all volunteers, so customer service is not their best quality. Most of them will sleep on the hammock or floor in the main area, where many party very late. This is about a 15 minute walk from the dorms, and was surprisingly quiet. We went for a night but stayed 4. Not our typical type of travel, this was only our second time ever staying in a dorm and stayed here longer just because we loved the beach so much. We had been to Maya Bay in Thailand where the beach was filmed with Leonardo DiCaprio. But after visiting Clear Water Bay we really feel like we found the real life thing. 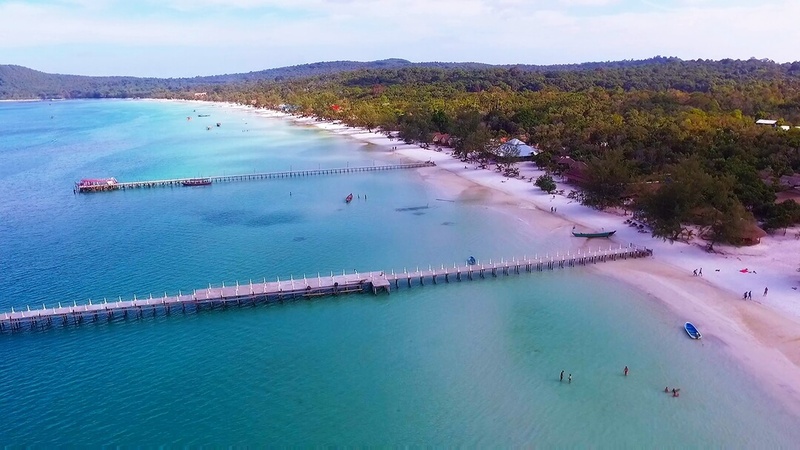 Lazy Beach is located on the outer side of Koh Rong Samloem and lucky enough to be one of the best beaches to view the stunning Cambodia sunsets from. At Lazy beach, only 25 minute walk from Saracen Beach, you will find a very different vibe here. As the name suggests, a much chiller vibe. There are no bars on the beach or pounding music but simply a medium sized restaurant and simple bungalows lining the beach. We didn’t stay for dinner but the Lazy Beach Restaurant & Hotel did come recommended. There are several different ways you can get to Koh Rong Samloem. You can catch a speed ferry, slow boat, or even a long tail boat. Make sure you know what part of the island you are going to first. Koh Rong and Koh Rong Samloem are large islands and if you need to catch a taxi boat they are quite costly. Most ferry companies will charge $20 USD return trip, and make it mandatory that you book 24 hours in advance. If you don’t book your return even if they have room may not let you on. 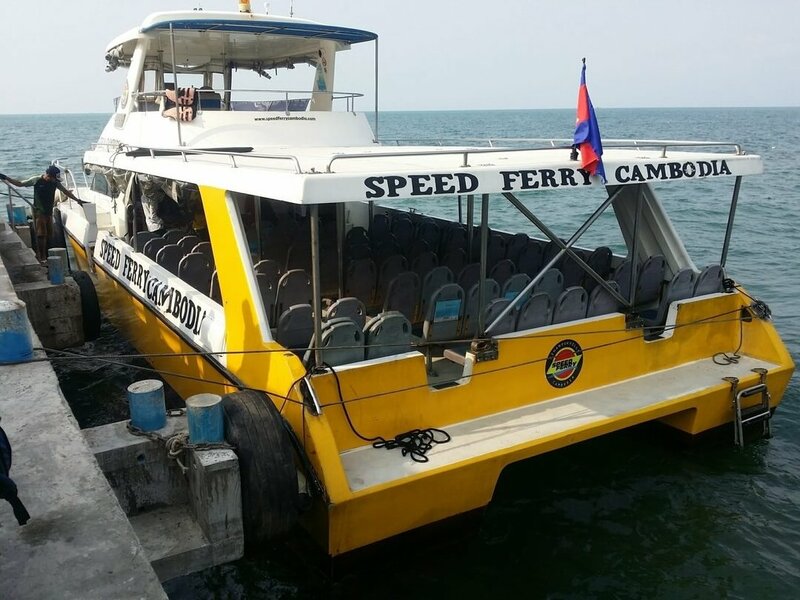 The main companies that have ferries are Speed Ferry Cambodia, Cambodia Island Speed Ferry, Angkor Speed Ferry, Buva, GTVC. Some of their “posted” schedule times are below. 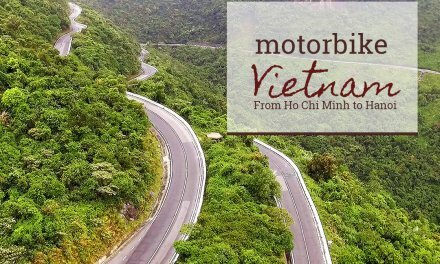 Most tour operators in Sihanoukville sell all of there services so make sure to tell them your destinations and ask the times. These are what the posted times are, but everything is subject to change. Speed Ferry Cambodia is the only ferry that goes to Driftwood/Clear Water Bay on Koh Rong Samloem so we booked our tickets with them. It was not a great experience. The smoke was horrendous, we had to stop several times, and turns out 2 or 3 of their big boats have done this for months. What was supposed to be 45 minutes, took us 2.5 hours. It’s a shame that a company continues business with ferries that create such toxic emissions for the environment. If you are not going to Clear Water Bay, I would suggest another ferry company. You must pre-book your ferry ticket 24 hours in advance when you want to return to Sihanoukville. You will be denied, even if there is room on board or if you want to purchase a ticket. Arrive early and get to the front of the line, it’s normal that these ferries are pretty packed and standing room only. On the way home, as busy as it was, was a new speed boat that took 45 minutes. Go Figure. Keep in mind the important logistics we mentioned at the beginning of our post. Bring money, no big bills, come prepared for little to no wifi, make sure to book your ferry 24 hours in advance and bring a backpack not a suitcase. Come with an open mind. There are substantial amount of sand flees, so make sure to bring bug spray for the sand fleas and mosquitoes at dusk. Everything is shipped over to the island by slow boat, so refrigeration and food standards are less prevalent so be careful with what and where you eat. But as we said, this was our highlight of our Cambodia Travel. After spending 6+ months in Thailand never did we see beaches so nice and secluded. The people are awesome and super laid back. This little island is kind of like an imaginary and awesome bubble where time and reality do not exist.